It’s important that any look starts with a cleansed and moisturized face (yes, even the guys). Any excess oils or dry skin will make the look cakey or flakey, which we don’t want. This look is a lot easier when applying a layer of foundation first because you can blend paint or makeup into the foundation. 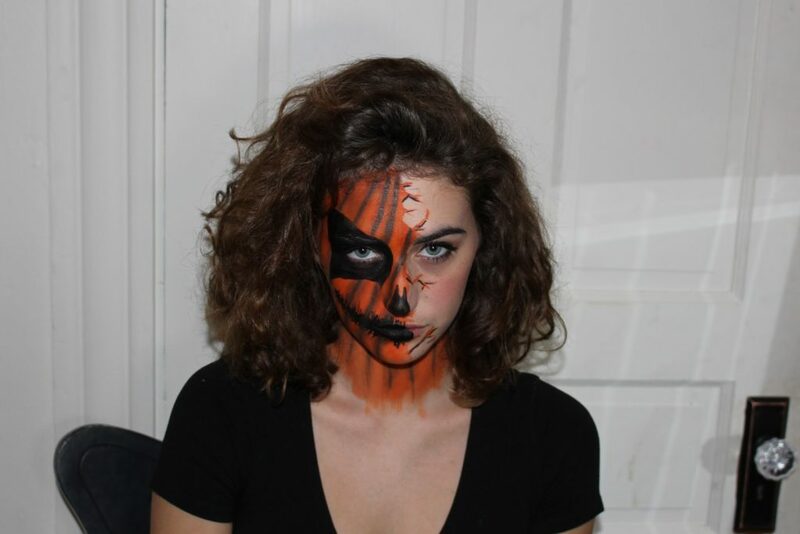 First, paint a line of blue face paint across the middle of the forehead and then start blending down. 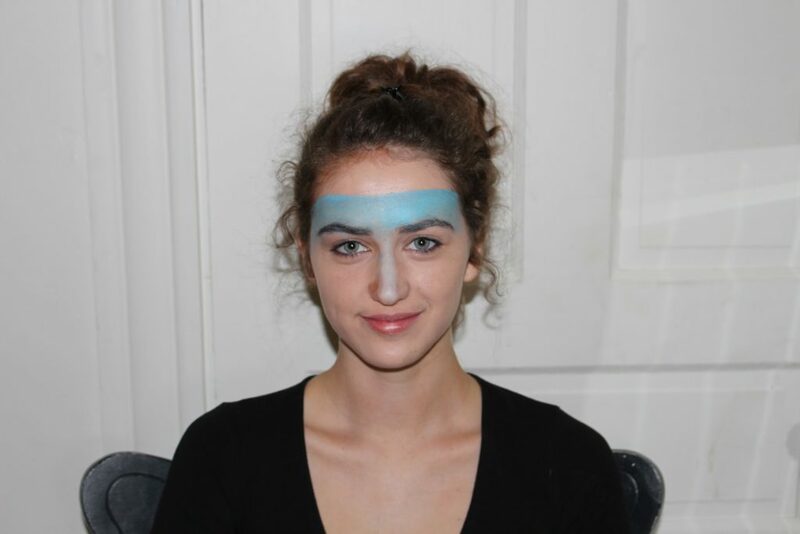 Using a sponge, pull the blue down your nose, adding a bit of white as you go, so it looks faded. 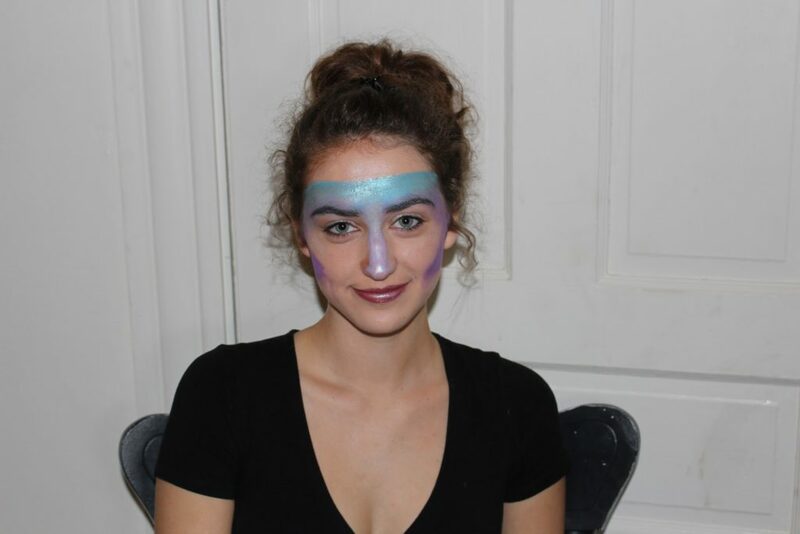 Add some purple face paint in just below the blue using a little sponge; keep blending until it looks good. There’s no exact science to this. 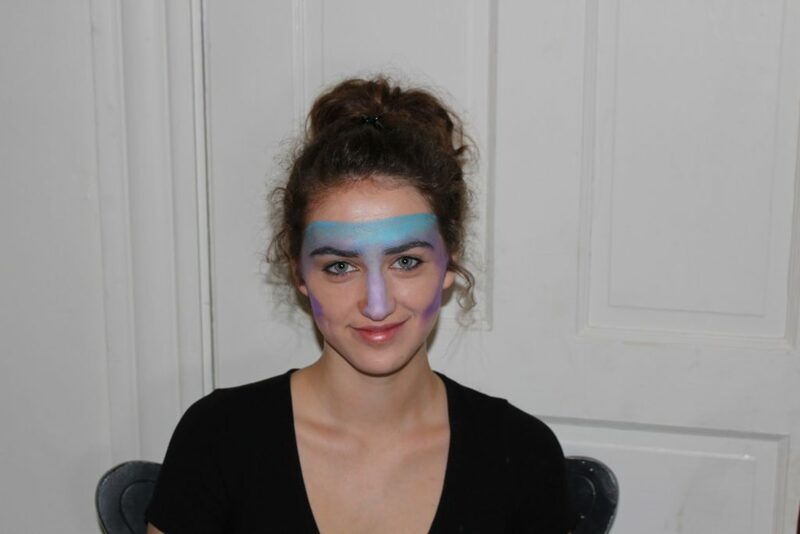 Add purple lines with a brush just under your cheekbones and blend them out using a sponge. 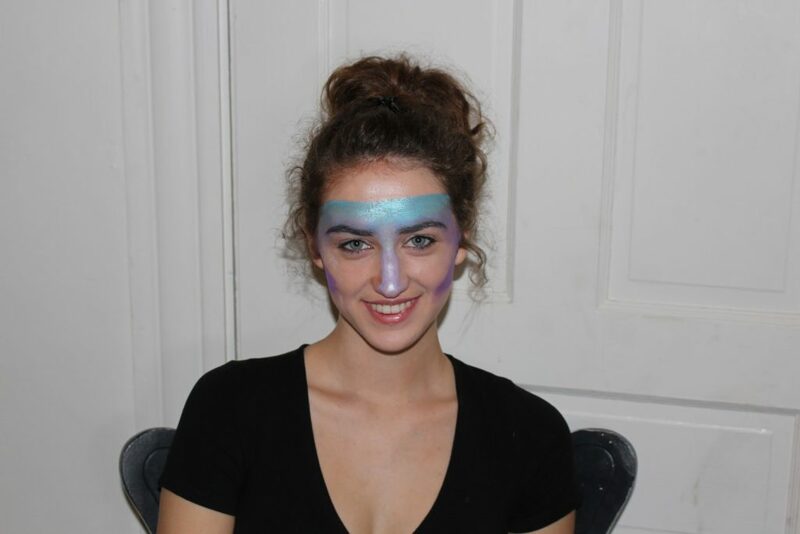 With a sponge, add some more purple face paint on top of your already blended colours for that super defined look. Add glitter! Go crazy with this. I used highlighter on the tops of the cheekbones along the blue line on your forehead and on the tip of the nose, but it can go anywhere. It’s all personal preference but I used cream highlighters. Add a pretty lip colour. I did a purple lip to match the look. And of course – add more highlighter on top. 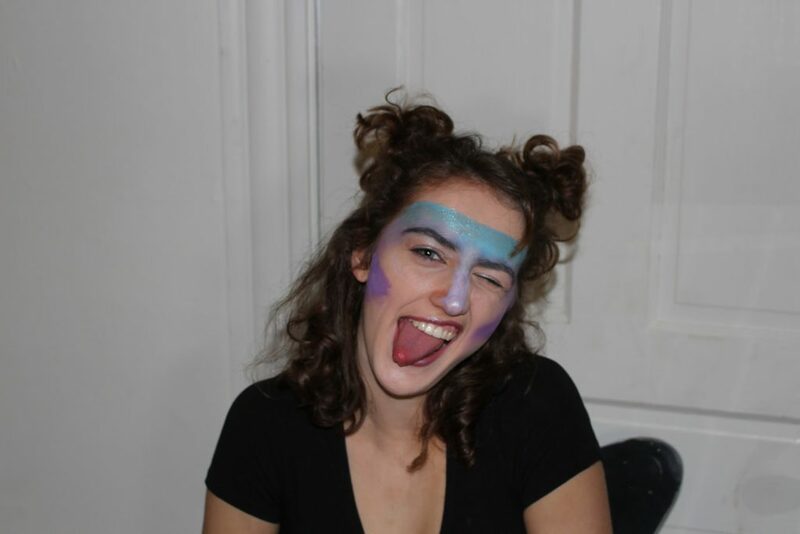 Throw your hair into some cute space buns, put on a shimmery top and say hello to your alien self! 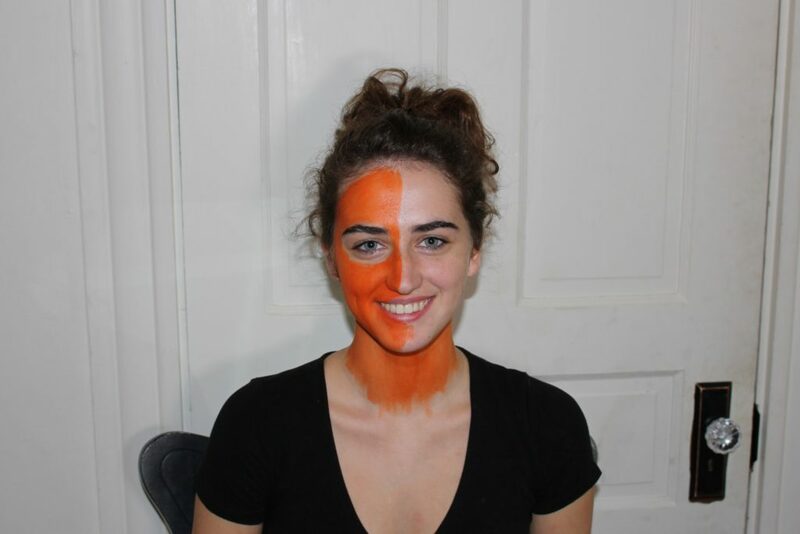 Apply orange – face paint, eyeshadow or lipstick – to one half of your face and all of your neck. 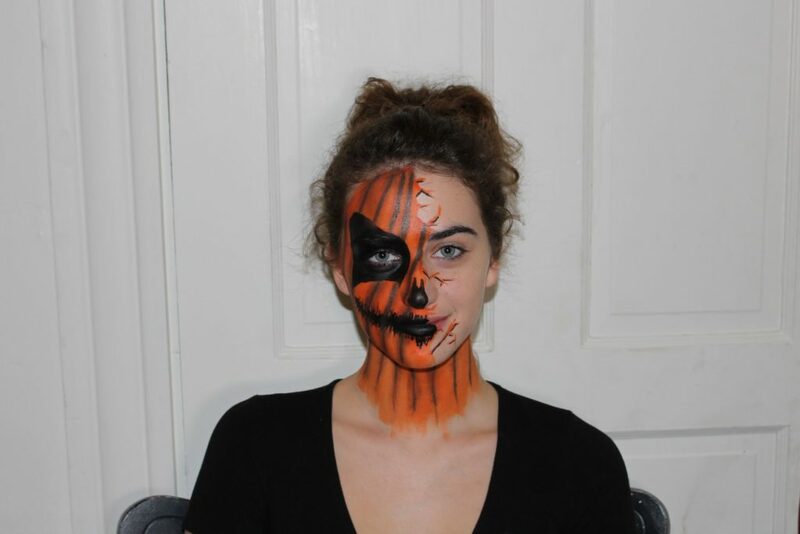 I used face paint from a Halloween store. One of the great things about this look is your dividing line doesn’t have to be perfectly straight. In fact, it’s best if it isn’t. This can be any shape you want. For this one, I did a less traditional eyehole because I wanted it to look a little menacing at the end. If you wanted a happy cracking pumpkin, I would recommend a simple triangle. 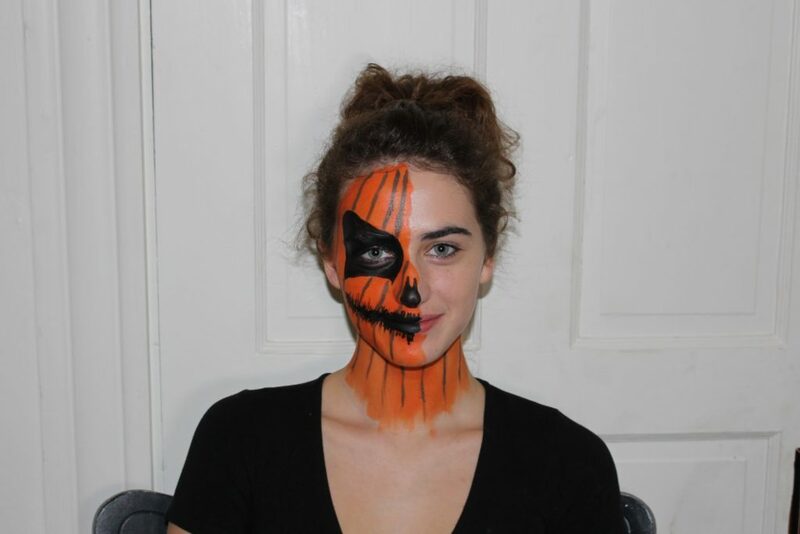 If you don’t want to buy any black face paint, liquid eyeliner works great! For the nose, make two points at mid-nose and then fill it in to the tip. Again, don’t worry about your tips being even – it just adds to the look. For the lips, start by painting your natural lips black. 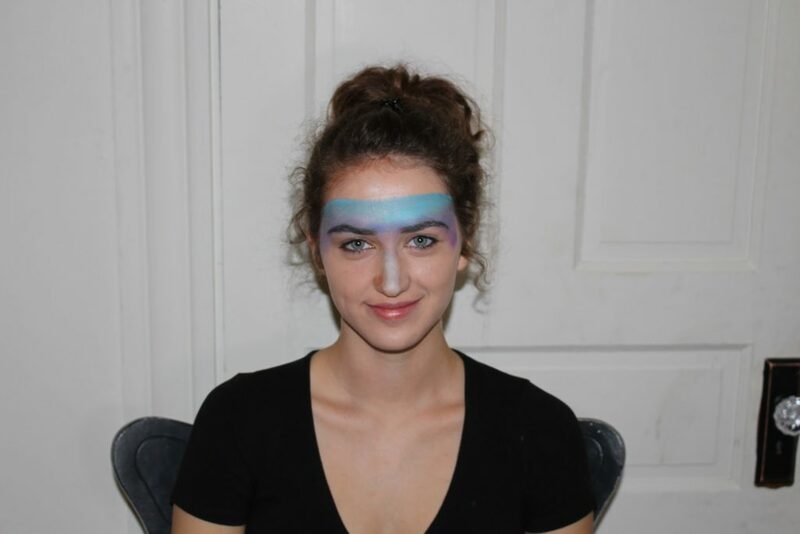 Then draw a line out to your cheek: the longer it is, the more dramatic the look. Then take a super thin brush and make little lines vertically from the black already there. This makes a smoother look than the traditional “tooth” smile that pumpkins have, because the lines on the traditional smile are super easy to make wonky, and you don’t want that. I used a light brownish colour for this, but it could be dramatic with black, or more-subtle with a darker colour orange. Next, shade those lines in. 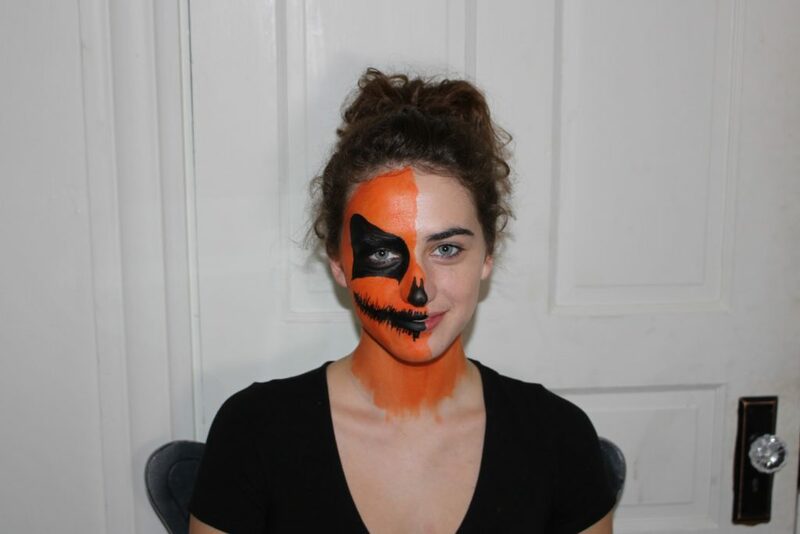 Take a similar colour to the one used for the pumpkin lines in a powder product, and blend it in next to the lines. If your lines are going to be done with a product that doesn’t dry, do this step first. 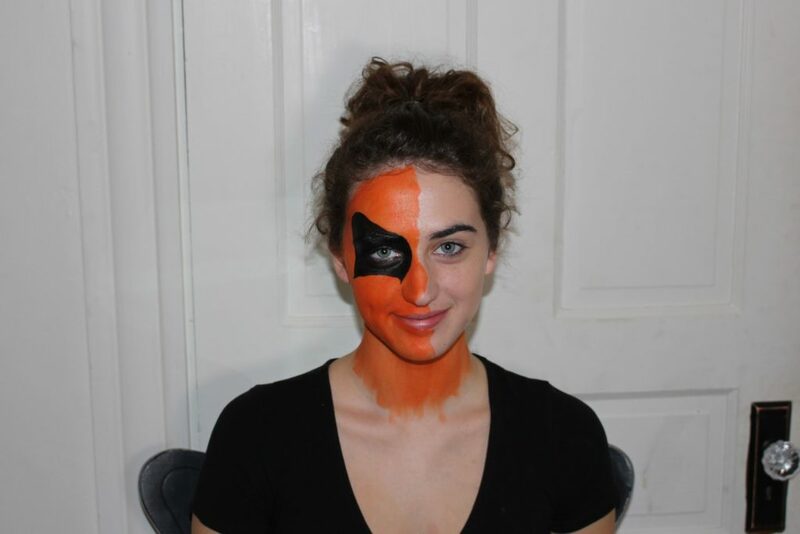 Time to start the cracking process: start drawing out little orange lines from the orange side of your face. Try to make it look as sporadic as possible. Take a little black and underline some of the orange lines to make them look three-dimensional. 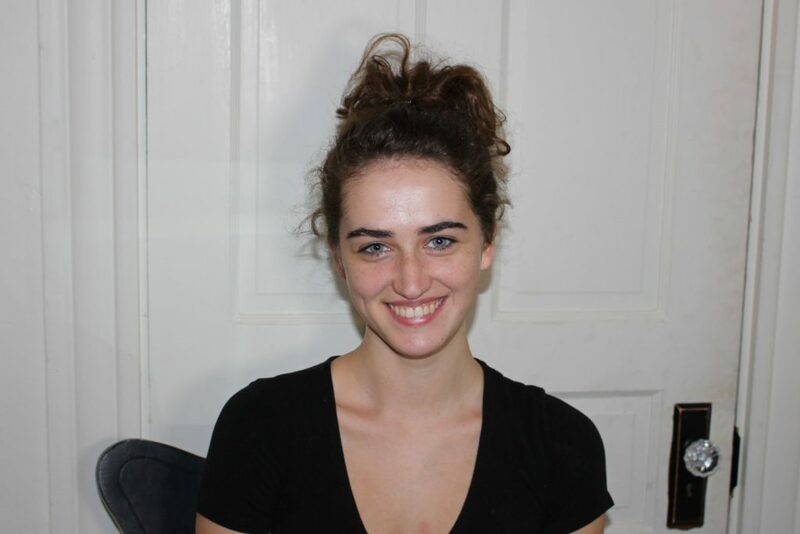 You can go crazy with the other side of your face or leave it bare. Last step: be your smashing self!